Learn the three sources of clubhead speed. When it comes down to it, you only have 3 primary sources to choose from. When you understand that, increasing your club head speed will make more sense. Most people think of increasing their clubhead speed as some sort of enigma, like black magic. The believe that some golfers just are gifted with lots of club head speed and others are doomed to play golf from the white tees for the rest of their lives! I'm here to tell you it doesn't need to be that way. The great thing about golf is that it really relies heavily on understanding basic physics and physic are completely quantifiable. That means that if you watch this golf instruction video by Chuck Quinton, you can learn not only what the sources of clubhead speed are, but exactly what to do to increase yours! Most golfers think that rotation is the way to increase clubhead speed. They believe if they spin their shoulders faster or spin their hips faster that their clubhead speed will increase. They believe this because they hear this non-sense on TV all the time. Nothing could be further from the truth. The reality is that if you spin your shoulders hard from the top, it will actually cause a LOSS of clubhead speed. Yep, you read that correctly. That's because when you spin your shoulders hard from the top, you create centripetal force too early in the downswing. The resultant force of this centripetal force is centrifugal force which acts on the club head and causes it to be thrown away - ie. you lose lag which is your most important source of clubhead speed. Did you know that for the average tour pro who swings a 6 iron at 92 mph, that only three feet away from the ball it is only moving 22 mph? How could the golf club more than quadruple in speed in only 3 feet? Because you spun your shoulders really fast at this point in the golf swing? Of course not. It's due to the releasing of the wrist angle in your swing. The release of this powerful lever creates about 66% of the clubhead speed in any good golfer's swing. This is the whole secret as to why tour pros look like they're not swinging very hard yet the ball goes a long way. Leverage is your best friend in the golf swing so it's about time you learn how to produce it in your golf swing. When it comes to power in the golf swing, every single amateur seems to want to know, "How do you hit it so far? How do you hit it further? 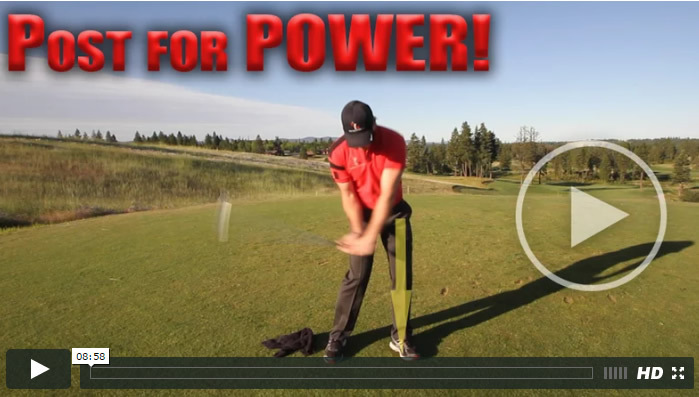 Where does power come from in the golf swing?" I'm going to make it really simple for you. There are basically three sources of power in the golf swing: leverage, width, and rotation. When it comes to those three things, most people think of the golf swing as being 100% rotation. That's where they get all their power. That's why you see golfers go to the top of their swing and then turn their body as hard as they can. What happens is they tend to lose the other two. They lose some width and they lose some rotation. Let's quickly go through what those things are so we can get a really clear picture of what it is and how you balance all of these things out. Simply put, leverage is, the easiest way to understand, is just angles here. Think of a hammer. I have an angle here. There's potential energy because my wrists can move in this direction. There's energy here. If I hit you on the head, it's not going to feel great. That's leverage. Width, simplest way to think about it, the biggest circle that you can make. Simple way of thinking about it. The wider that circle is, the more time the club has to accelerate. There's other physics at work here as well. This part is moving at a certain speed. The outer part of the circle has to move faster to keep up with it. The wider the circle, the more potential there is for speed. Simple way to think about it. If you're hitting a wedge, just because of the shorter shaft, even if you put a driver head on a wedge shaft that's really short, it's still not going to go as far as a driver. There's not as much potential speed because the shaft isn't as long, so you're losing width. The last one is what I was just talking about is rotational power. Obviously, the rotary swing, we want to use rotation. The golf swing is essentially rotary-based. But what the key is is we want to learn to balance all of those things out. Where most golfers go wrong is that they overemphasize rotation and it costs them leverage and width. What do I mean by that? Let's say I go to the top of my swing. I've got some leverage. I've got some width. My hands are out here. I've got a long shaft of the club, so I've got a lot of potential energy. I didn't swing like this and really narrow. That's not going to give me any width. There's not a lot of time for me to accelerate the club, but as I take the club out in a nice, big, wide circle here, I've got some width. Now where most mistakes are made is that I go from here and I'm going to rotate my body as hard as I can. Well, what happens is all of a sudden, my golf club is going to tend to want to get thrown out away from me because I'm rotating so fast. I'm creating a lot of centrifugal force. But your result of that is going to be centrifugal force. The hands, the wrists, are going to tend to lose their leverage as the body spins too fast. You want rotation in the swing, but it has to be balanced out. The other thing that you have to think about is where most of your feet actually comes from, relatively, is leverage. That is the release of this right wrist angle in the swing. That's where the majority, about 60%, of your club head speed comes from. At all costs, you want to protect that. The last thing I'd want to do is rotate so hard and fast that I lose my leverage from my wrist angles. What I want to learn to do is balance all of these things out, having a nice, wide swing, which gives me a lot of time to build up speed, coils up my body so I do have the ability to rotate, but I want to protect the leverage. I want to protect this angle. This is our baby here. We don't want to lose this too soon in the swing by spinning out and then all of a sudden we don't have any leverage to hit with at the bottom. Imagine using a hammer and not cocking your wrist and just trying to hit a nail like that. It's not going to go very well. If I had to prioritize things in the swing, when it comes to hitting the ball further, you want leverage as your primary piece. You've got to always preserve width. Then you want to start to use rotation to help accelerate all of those things together. Above and beyond all else, protect leverage. That's your most powerful, most efficient move for speed in the swing. Then you slowly learn to blend all those things together, going through the videos on the website, learning how to shift your weight, learning how to maintain your width in the takeaway to get to a wide spot at the top, et cetera. Then you'll start to understand how power and speed is developed in the golf swing. Get Your Free Membership to Finish Watching "3 Sources to Increase Your Golf Swing Speed" Right Now!